A short answer to what is SkyDrive would be "SkyDrive is a remote storage system." But is that all? Windows SkyDrive contains many other features as well. With Office Web Apps available on SkyDrive, one can also create, edit, and view Microsoft Office files using SkyDrive. A proper answer to what is SkyDrive would be as follows: "Windows SkyDrive is a service that offers you 25 GB of free storage, allowing you to store files of any type with an emphasis on file sharing. The service also allows you to create, view and edit MS Word, MS Excel and MS PowerPoint files without the need for a locally installed MS Office system". With Office Web Apps integrated into SkyDrive, you can easily view, edit, and create MS Word, MS Excel and MS PowerPoint files even if you do not have MS Office installed on your computer. As mentioned earlier, SkyDrive is a remote storage service from Microsoft. When you register and login into SkyDrive, you get five folders by default. They are Photos, Shared Documents, Shared Favorites, My Documents and Favorites. The default share permission of Photos, Shared Documents and Shared Favorites is set to "Everyone" and "view only." This means that anyone having the link to the folders can access these folders and view the contents of the folders and files therein. However, they cannot make any changes to these. The default permissions for My Favorites and My Documents are set to "me," meaning the contents are visible only to you. 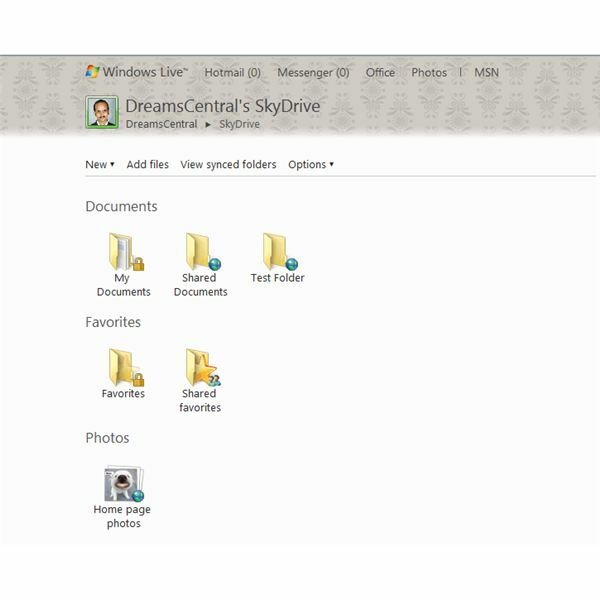 SkyDrive allows you to create folders and subfolders to organize your online storage. When you create a folder in SkyDrive root, you get to select the level of privacy (the share permissions). If you choose not to change the default permission, everyone can view it. If you create folders inside a folder, the subfolder will inherit the share permissions from the parent folder. The same applies to the files you upload or create. While uploading files, you can upload almost any type of file. While creating files, you can use the free Office Web Apps to create only MS Word Document, MS Excel Spreadsheets and MS PowerPoint presentations. The functionality of free Office Web Apps is however, limited. This means that you do not get all the features that you get in the paid desktop versions of the software. Still, you have plenty of options for formatting and editing the documents, spreadsheets and presentations. Comparing SkyDrive with Google Docs, the latter also allows you to create folders (called collections). It also allows you to upload files and to create files in root or in specific collections. Unlike SkyDrive, Google Docs allows you to set individual sharing permissions for each entity irrespective of its location. Another difference that I noticed is that while uploading and downloading, the format of documents, spreadsheets and presentations is changed to an open format to enable online editing without the need for a local copy of MS Office. Office Web Apps in SkyDrive too, allow online editing without the need for a local copy of MS Office. The only drawback of Google Docs is that you cannot use it as a backup system. This explains what SkyDrive is. If you have anything to add, please do so using the comment boxes.